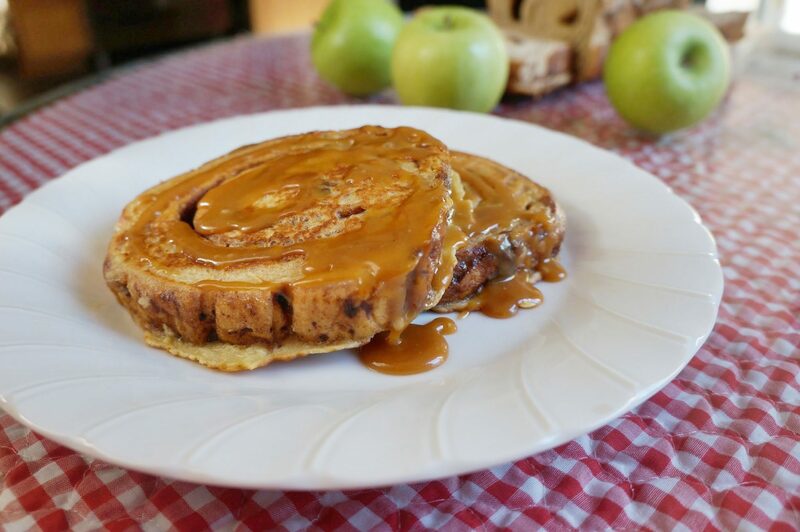 Cinnamon Apple French Toast. Did you lick the computer screen? It’s ok. Don’t be embarrassed. It’s just you and me here. I’m not telling anyone what you did. Who can blame you? There just isn’t anything better for breakfast. Warm, fragrant, covered in homemade buttery caramel sauce, this recipe will knock your socks off and it’s a snap to make in a jiffy. I was looking at the breads one day at the shop, trying to figure out what I wanted. When I picked up a cinnamon-raisin swirl loaf, the store clerk who was stocking the shelves jumped up and said, “Oh my gosh, that bread is just amazing. You’re going to love it!” I do love it, because it’s beautiful. I love it, because it tastes amazing. Most of all, I love that it has none of that nasty HFCS (high-fructose corn syrup) and I can pronounce all the ingredients. So I grabbed a loaf and zipped home to make Cinnamon Apple French Toast. It’s like having caramel apples for breakfast, but healthier. The basket of day-old goods at the bakery is so baffling. What’s wrong with bread that was baked yesterday? Don’t get me wrong – there really is nothing better than anything hot out of the oven, but wasting bread always seems like sacrilege somehow. So, we make the custard and we dip-dip the stuff from that basket into it and we fry it in butter. Day-old bread comes back in fresh new form. Making French toast is always something of a hippie cooking experience for me, because nothing really has to be measured precisely. A good splash of milk, 1 egg – no make it 2 or 3, it really doesn’t matter all too much. As long as you have something in there to call it a custard, you’re doing fine. Shred some Granny Smith apples into the mix for an unexpected (and nutritious) surprise, then finish with a generous drizzle of buttery caramel sauce and you’re sure to wow them with breakfast. Voila! You have Cinnamon Apple French Toast. What better way to keep the doctor away?